Each Mastercam post processor is unique due to factors including specific machine and control makes and models, as well as customer preferences. To get the best results, the In-House Solutions Post Department needs the right information. This page will help you identify the questions to ask your customers that will in turn increase the speed and accuracy of their posts – and save project management time for everyone! Why use the In-House Solutions Post Department? In-House Solutions has a dedicated full-time post department for all of your post processor needs. Providing our customers with posts since 1988, we have earned a great reputation for their quality and now have one of the largest post departments in the world. Our experience with Mastercam-specific post processor solutions is second to none, and our developers are willing and able to take on any challenge. We have an extensive library that is continually developed and expanded to include the most common and newest machines and controllers on the market. If a post is not already available in our library, we can develop a custom one for nearly any machine. We have great relationships with OEMs who provide us with technical information for both machines and controls. This in turn allows us to produce post processors that will generate edit-free code for your customers and run their machines efficiently. We specialize in 5-axis milling machines and multi-tasking machines with multiple rotary axes, spindles, and turrets. We also have posts for a variety of router, laser, waterjet, and plasma machines. More complex options like different heads/configurations and additional tooling for a single machine can complicate the post. This requires us to develop specific programming strategies alongside the end user to ensure the generated code is correct for the machine. Gathering as much information as possible from the end user up front helps us deliver the most accurate post. This information is beneficial for our developers and will help increase speed and accuracy of your posts. Today’s machines have a vast range of options and can be set up and run in various ways. This means that two identical machine models may require different code depending on how each is set up and how the customer would like to use it. Most of this critical information can be found in sample files, manuals, and machine-specific documentation. Does your customer have specific code preferences? We can work with those. Our posts come with the most common options built-in, but we can add or remove these depending on the customer’s needs. There are many different options within the machine control parameters that can have a direct influence on the required output code. Often these options are built-in as switches that can easily be changed based on the specific machine setup. Is your customer unsure about setup or options? Since there is no standard dictating how machines are set up, we rely on certain details from the end user or AE. While we can accommodate most options on machines, the tweaking of the post is normally done to meet a customer’s expectations for a specific code format. Our expertise allows us to extend beyond just providing a post processor; we can provide recommendations on setup and options if the customer is unsure. Each machine requires its own unique post to accommodate the customer’s unique machine setup and specifications. The more information the customer provides up front, the more quickly and accurately we can set up their post processor. 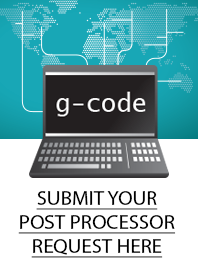 Our goal is to produce quality posts that will generate edit-free code for your customers and run their machines efficiently. In-House Solutions has been implementing successful post processors around the world for decades, and we look forward to the next challenge. How can we help you?